A three-game winning streak doesn’t normally warrant a discussion about whether or not a team has “found its identity”, but this Celtics season has been far from normal. Unlike the Bruins, the C’s came out of the All-Star break with absolutely no sense of urgency. When you include the two bad losses to the Clippers and Lakers the week before the break, they went 3-7 from February 7th to March 3rd. Falling to the bottom-feeding Bulls was the ultimate low-point, especially after beating them by 56 back in December. Following that up with losses to the Raptors, Blazers, and Rockets over a four-game span could very well have been the nail in the coffin for this 2018-19 campaign. Then came a California road trip. Nobody could have anticipated a blowout win over the Warriors in Oakland, and the momentum from that game carried them right through the Kings and the Lakers for their first three-game winning streak in over a month. If they beat the Clippers on Monday, they’ll complete the Cali sweep. The most glaring difference in these last three games has been the ball movement. You know that great team basketball that the Celtics play without Kyrie? They might actually be learning how to play that way with number 11 on the floor, and that starts with Irving taking less shots and allowing other guys to find their rhythm. In the loss to the Lakers on February 7th, Kyrie took 21 shots. In the loss to the Bucks on February 21st? 27 shots. In the worst loss of the year (the Bulls) on February 23rd? 24 shots. In the loss to the Blazers on February 27th? 24 shots. In the best win of the year so far (Warriors on 3/5), the Celtics had four different players with field goal attempts in the teens, but nobody had more than 16. Gordon Hayward and Jaylen Brown led the team with 16, Kyrie had 15, and Jayson Tatum had 13. In last Wednesday’s win against the Kings, Tatum led the team with 17 FGA’s. 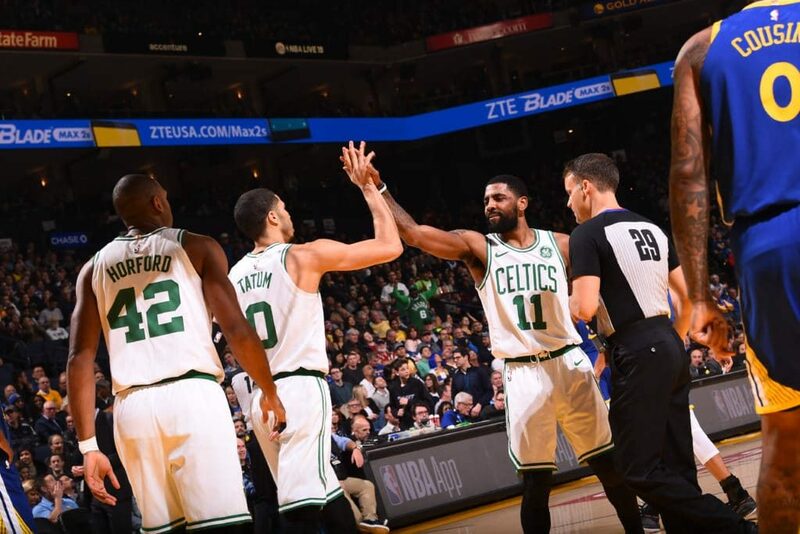 In Saturday’s win over the Lakers, Kyrie had 18, Marcus Morris had 16, and Jaylen Brown had 12. There will be rare instances where someone (usually Kyrie) will need to take over a game by himself. But as it stands right now, this team is at its best when nobody has 20+ attempts. There is way too much talent on that roster for one guy to be shooting the ball way more than anyone else. Monday’s matchup with the Clippers is at 10:30 pm ET.